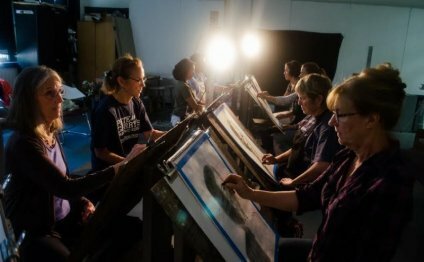 The Museum of Fine Arts, Boston, offers year-round studio art classes and workshops taught by experienced educators and professional artists in a unique setting. Access to a world-class collection of art provides inspiration for studio exploration. Studio art classes and workshops include day, evening, and weekend classes and workshops for all ages. You can also register for classes offered through our partner schools: Diablo Glass School, Eliot School, and Stonybrook Fine Arts. The teen program for ages 12-18 includes weekly Saturday classes, workshops, school vacation week classes and summer classes and intensives. Classes include: drawing, painting, mixed media, sculpture, animation, photography and printmaking. The kids program for ages 5-11 includes weekly Saturday classes, Sunday classes and workshops, and school vacation classes. Groups of up to 12 children (grouped by age) discover new places and cultures, visit our galleries, and draw, paint, sculpt, collage, and print. The preschool program is designed for children ages 4–5, who are accompanied by an adult. Classes combine a gallery experience with an art project in the studio classroom. Preschool sessions meet once a week on Sundays for five weeks. A great way for any preschooler to explore art! The MFA is delighted to present programming through our studio art partnerships between the Museum and the Eliot School of Fine and Applied Arts, Diablo Glass School, Institute of Classical Architecture and Art, and Stonybrook Fine Arts, which allow students to create art using specific media found in our world-class encyclopedic collection. Students explore a range of media from glassblowing to wood-working to welding and more at these offsite classes.